Regency era author Jane Austen may have penned some of the English language’s most well known novels, but her own private life might be called by some quiet, secluded, and even insular. In fact, however, it is that very closely focused existence that allowed her to scrutinize and study human nature and draw universal conclusions that are as relevant today as they were when her fiction was first published. Jane Austen was born December 16, 1775, in Steventon, Hampshire, in England. Her father was Reverend George Austen, and her mother was Cassandra Austen, of the Leigh family. She had only one older sister among her seven siblings, also named Cassandra, and the two were close through their lifetime. Among her six brothers, Jane was closest to her older brother Henry. Jane Austen was raised in a household that welcomed learning, discourse, and creativity. She and her father, who took on side jobs outside of his duties as rector in order to support his family, including farming and teaching, had an extremely close bond. At the age of eight, Jane and her sister, Cassandra, went to boarding school to begin their formal education. However, at that time a woman’s formal education was limited to foreign language (usually French), music, and dancing. But Jane’s education was thorough, rounded out by her own reading and lessons she learned from her father and brothers. George Austen had an excellent library that was open to all of his children, and Jane took full advantage of it. A forward-thinking man, he also made sure he kept the young writer supplied with paper and writing supplies. By 1787, Jane Austen had penned three notebooks filled with poems and fictional explorations, a body of work that would later be known as the Juvenilia. In 1789, she wrote Love and Friendship, then dove into playwriting. She gradually took her writing more seriously, and before 1796, she had completed a work she called Elinor and Marianne, from which she would read aloud to amuse her family. In December 1795, Jane Austen was introduced to Tom Lefroy, and the two began spending a great deal of time together. Both families noticed, and Tom’s family was none too excited about a possible match between the two, due to the Austen family’s lack of expansive fortune. They sent Tom away, and the young couple was never to be reunited again. The author did admit to falling in love with Lefroy, but even though the experience ended with the couple living separate lives, she did not allow her heart to become closed or embittered. 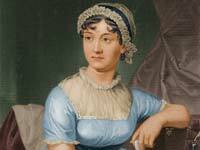 Jane Austen was prolific when she settled down to write, usually having several projects actively working at the same time. She began working on serious revisions to Elinor and Marianne, completing the process in 1798. She then turned back to an earlier work, Susan, which would later become the novel Northanger Abbey, while simultaneously polishing an earlier manuscript of a play. Next, she finished the first draft of perhaps her most beloved work, First Impressions, or as it would later come to be known, Pride and Prejudice, in 1799. In 1811, her novel Sense and Sensibility was published, and the first edition sold out completely within two years. In 1813, Pride and Prejudice was published, to both popular success and critical acclaim. Next came the publishing of Mansfield Park, then Emma, Northanger Abbey, and, after the author’s untimely demise, Persuasion. In early 1816, Jane Austen’s health began declining. By early 1817, she found herself unable to walk at the age of 42. In July of 1817, she passed away. However, though Jane Austen saw some success as a writer during her life, her actual identity was not revealed until after she died, by her brother, Henry. Her siblings, especially Henry and Cassandra, worked hard to keep her works in publication and to ensure that Persuasion was published.